The Aaton XTR Prod Super16 is a very versatile piece of camera film engineering that combines comfortability and quick-operating with beautiful quality. It features a full-function LCD display with interchangeable viewing screens. The VR42 black and white assist and VR46/VSA for high quality get the job done at low power consumption. The surprising shoulder handholdability of the quiet & easy to thread low consumption 800 foot magazine (frankly, it deserves a technological award for its ‘floppy drive’ system). Power 10-14 V, 600 mA, with film à 25°C / 77°F. Temperature Range -20°C / +4°F to +40°C / +104°F. Noise Level 20 dB -1/+2. Speeds preset speeds of 6, 12, 18, 20, 23.98, 24, 25, 29.97, 30, 36, 40, 48, 60 and 75 fps. Built-in variable crystal control from 3 to 75 fps in 0.001 increments. Image Stability Co-planar claw and lateral pressure. Vertical and lateral steadiness to 1/2000 of image dimensions. Viewing Screen Interchangeable FiberOptic screen available in 1.33, 1.66, 1.78 (16/9) and 1.85 aspect ratios and combinations thereof. Aatonite illuminated markings. Lens Port Interchangeable hard fronts: ArriPL as standard. 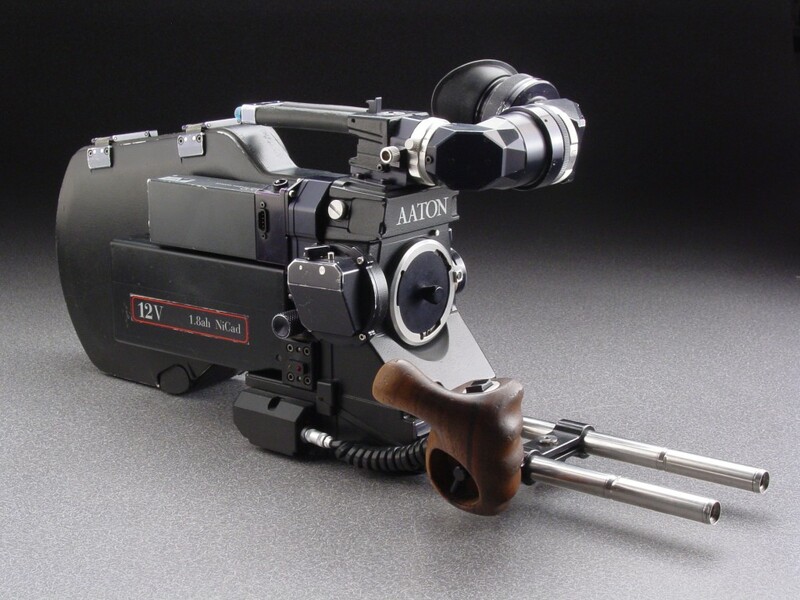 Aaton universal and Panavision on option. Formats 16 / Super16 operation. Field-convertible quick centering of lens axis, viewfinder and CCD target between formats. Shutter Reflex mirror – multi-position 180°, 172.8°, 150°, 144°. Time Recording AatonCode; in-camera, at-the-gate matrix recording of man-readable figures and machine readable data. TCXO control for 1/2 frame accuracy over 8 hours internal clock. SMPTE and ASCII-RS232 in. Weight 6kg / 13 lbs with 400 ft load and 12V on-board baterry. Accessory Inputs Amph9 (video sync), Lemo6 (power zoom), Lemo8 (phase controllers), Lemo14 (CCD assist), Lemo5 (Smpte and RS232 time input) and Lemo2 (camera on/off). Video Assist (option) Black & white – low power (170mA) high sensitivity, with manual iris. PAL or NTSC. 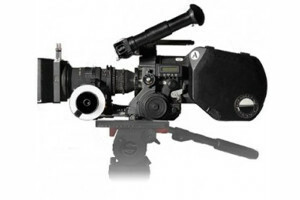 Color – high sensitivity, flicker-free (frame-store in NTSC), with frame, timecode windows, video generated adjustable frame and Vitc insertion. PAL or NTSC formats. Magazine 400 ft, coaxial instant DX magazine, quick loading, magnetic drive, no timecode-related parts. LCD Control Panel Illuminated display. Pre-set and variable speed selection, ASA selection, battery voltage monitoring, remaining footage, short end reset, elapsed footage, mag ID, full timecode readout. Warnings Low speed, problem with the magazine, low battery, end of film coming soon.